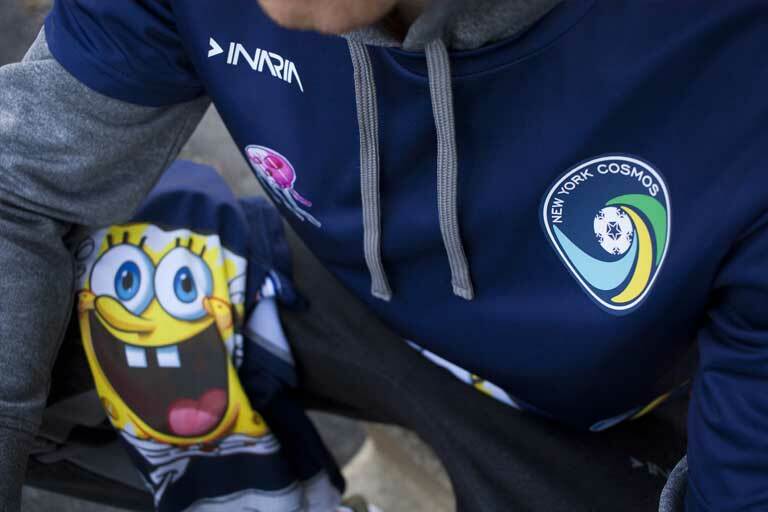 New York, NY – The New York Cosmos and Nickelodeon have partnered to host the SpongeBob SquarePants: You Bring the Color night at MCU Park and INARIA has provided customized kits to mark the occasion. For the first time ever, SpongeBob SquarePants: You Bring The Color allows fans to help color brand-new SpongeBob SquarePants episodes for a chance to have their creations featured on Nickelodeon this fall. 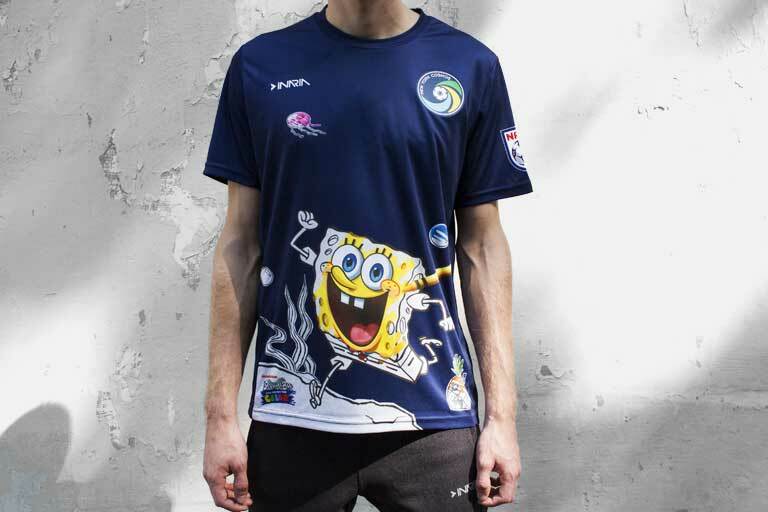 On Saturday, September 23, when the Cosmos face North Carolina FC at 7:00 pm, the team will warm-up in wholly sublimated navy kits with colorful Spongebob details. 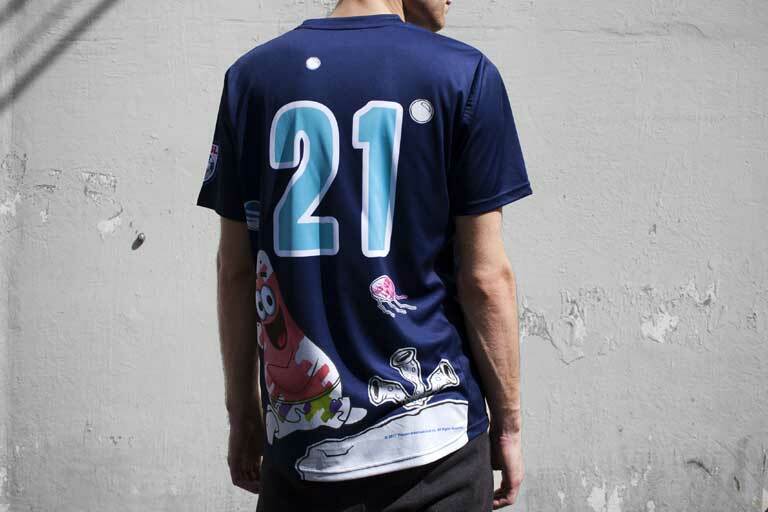 The jersey features the Cosmos navy pantone mixed with an assembly of colors from the Spongebob theme. A raised rubber INARIA mark is paired with the same silicone Cosmos Crest worn throughout this season. In continuation of the team’s efforts to aid those affected by Hurricane Harvey, Cosmos players will wear customized INARIA-branded Nickelodeon SpongeBob warm-ups. Additional SpongeBob warmups will be autographed by players and raffled off, with 100% of the proceeds going to the Greater Community Foundation of Houston’s Hurricane Harvey Relief Fund. New York Cosmos is a professional soccer club playing in the North American Soccer League (NASL) out of Brooklyn, NY. The NASL operates within Canada and the United States. For more information, please visit www.nycosmos.com. INARIA designs and manufactures a full-line of team sports and active apparel, including pro-style jerseys, practice jerseys, socks, warm-up suits and training apparel. The company offers full finishing, embellishment and unique customization services at its Global headquarters. By providing superior quality, value and quick turnaround time, the company’s goal is to continue to develop strong relationships with its customers and loyal sports enthusiasts. For more information about INARIA, visit the company’s website at www.inariasoccer.com.